All the railway lines are part of the FS state-run railway system and stop at a station on Piazza Vittorio Veneto, well away from the historic center (about 3km from the center in the lower suburb of "Fontivegge" or "Fonti di Veggio") but a 15-minute ride on buses from the center of town. 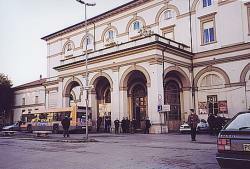 Bus services leave from the forecourt outside the station and, depending on the service, drop you in Piazza Italia or Piazza Matteotti, both equally convenient for Corso Vannucci. City bus tickets (valid for 40 or 70min) are available from a small booth in the forecourt or a machine by the entrance. Perugia also sits on the privately run FCU train line that serves Umbria. 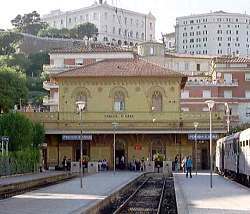 Its main station in Perugia is "Stazione Sant Anna" ( halfway up the hill, just off Piazza dei Partigiani), all the regional trains pull first into the outlying Ponte San Giovanni Station, then chug 10 minutes up a capillary line to the Sant'Anna Station . All outgoing trains depart first from Sant'Anna Station.